Sayre Freshman Wins Essay Contest! 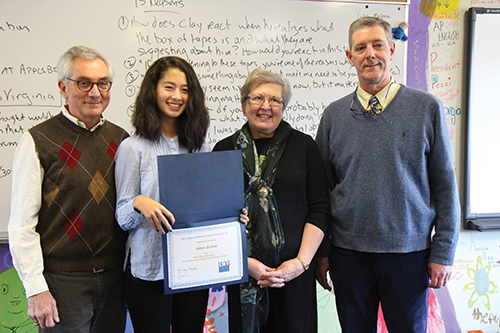 Upper School English teacher George Bebensee introduced the opportunity for his students to enter an essay writing contest sponsored by The League of Women Voters®. The contest is open to students in grades 9-12, who attend either a public or private Fayette County high school. In regards to the 2016 presidential election, students, as voters or potential voters, were asked to tell their story as a citizen who has lived through this particularly divisive election experience and what they have learned from it. “Generally, we receive 30-40 essays, however, this year the prompt attracted the most serious thinkers and skillful writers with 14 contenders from six different schools in Fayette County,” according to Judy Johnson, a representative from The League of Women Voters. Sayre ninth grader Hanae Yoshida submitted her essay titled: “Election 2016: Do You See What I See?” and won the contest by unanimous vote! It was the first year Sayre participated in the contest! The League of Women Voters said it was the first time judges chose the same essay to win the competition. "I am excited to tell you Sayre has a prize winner in our essay contest. I am so pleased for two reasons. The writing is honest and excellent and very skillful for a 14 year old. Also, we have not had entries from Sayre before, so this is a first," said Judy Johnson of The League of Women Voters. Hanae’s teacher George Bebensee says, “Hanae’s essay is a sobering, heartfelt personal narrative by a biracial immigrant student who sees America divided and angry. While the essay examines the effects of the volatile election environment, it also offers hope in perseverance and steadfastness. Hanae writes beautiful essays full of emotion and intellect. She has a remarkable ability to see things in an expansive way and then explain what she sees with specific and detailed examples that move her readers. I am very happy to see her win this award." The following is an excerpt from Hanae’s essay. Sayre School couldn’t be more proud of Hanae’s work. Hanae being the first place winner as a 14 year old is an extraordinary honor.